Scuba Fin Maintenance centers around maintaining your enjoyment, with that said there are two things that can affect fin enjoyment and performance. Number one is standing the fins of their tips. It really does not matter how long, eventually the fins will begin to warp and disfigure. 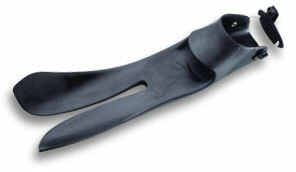 The second thing that can affect scuba fin enjoyment and performance is heat. Getting stuck in a divers hot truck, with other pieces of scuba gear on top, most fins will warp pretty quickly. The most famous deforming fin was the US Divers blade fins, after a couple of years, these fins look like some sort of circus clown fins. Before each dives, give your dins one lat check. Look at the foot pocket or fin straps. It is always a long walk back to the cat if your fin strap breaks or your foot pocket rips at the start of the dive. As with all of your scuba gear, always wash with fresh water and double check your foot pockets or fins straps. If you need to replace something, now you will have time. Consider investing in a save-a-dive kit.